Samsung has launched its latest Family Hub Refrigerator complete with three new app partnerships that will enable Australians to manage and control more aspects of their lives from the kitchen. “Australians are starting to realise the benefits that integrated smart technologies can make to their lives and the Family Hub is a great example of just how innovations in connected products can help make life easier,” says Jeremy Senior, Director Home Appliances at Samsung. New app partners including Uber, Nespresso and Ring Doorbell continue Samsung’s commitment to provide Australians with connected experiences that are designed to support the lifestyles of busy households. Nespresso, Uber and Ring join Woolworths and Spotify in Family Hub’s stable of apps that enable Australian families to perform a range tasks from the connected refrigerator’s touch screen. From placing an order for more Nespresso coffee capsules, to booking an Uber ride to an important event, or using the Ring Doorbell Pro and Elite to see who is at the front door; the Samsung Family Hub promises to transform the way Australians manage their food, communicate with each other, and organise their life. “As a coffee-loving nation, we know many Australians like to start their day with a coffee moment,” said Loïc Réthoré, Market Director at Nespresso Oceania. Family Hub has extended the ability for Australians to complete the grocery shopping from home via the Woolworths and Nespresso app, enabling Australians to order food, amenities and coffee pods directly from the Family Hub’s interactive LED screen. Time management is also made easy with the ability to order and track an Uber directly from the Family Hub. Completing the connected home line-up, the Family Hub now connects the Ring Doorbell Pro and Elite to the fridge to see who is at the door right from the kitchen, without having to leave the stove. 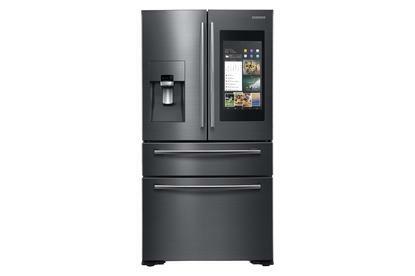 Family Hub features a 21.5-inch LED touch-screen which serves as the refrigerator’s digital command centre. To help manage the family, the screen acts as an interactive digital bulletin board where family members can share photos, leave memos and view each other’s calendars. From June 30, current Family Hub users will be able to upgrade to the 3.0 software. The Samsung Family Hub is available now from Harvey Norman, JB Hi-Fi Home, The Good Guys and Bing Lee for $5,499.